It’s pitch black. Green lights flash on the horizon. A steady hum pulsates through the alkaline air. Move carefully my friends, we’re in the center of the universe and it’s bound to get a little hot. 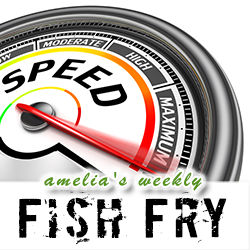 This week’s Fish Fry is headed to the land where power reigns supreme and the lights are always on: data centers. Robert Blake (CEO – Achronix) joins Fish Fry to discuss the multi-layered relationship between field programmable gate array technology and data centers, what the new Achronix PCI accelerator card is all about, and a little bit about innovation in companies big and small. Then, keeping with our data center theme, we investigate how Google is using their DeepMind AI to keep their data centers cooler.